I don’t know about you, but for me the more I look at Modern Plastic Urban Motorcycles, the more they look generically all the same. I’m sure regulations have had their say in why everything now looks and goes in a similar vein, but for me all the current crop of modern bikes are soulless and bland. 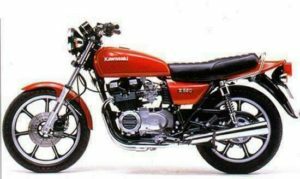 I know it’s a cliché phrase but the older I get – the more I appreciate 80’s urban Japanese motorcycles or (UJMs as the press call them). Yes I’m sure they do everything clinically well and don’t break down in the way our old rides used to, but in terms of styling I just keep harking back to the bikes I dreamt of and thinking that in current times, something mid eighties has a certain appeal. Now to fill you in to the background or this mind set, back in the day, my Sunday afternoons were mainly spent down at Boxhill Dorking in Surrey watching the hundreds or Suzuki GS models and Kawasaki Z bikes that were so popular and now that also represent great investment values in a time when you get nothing for leaving your money in a building society. Take a classic all time great like a Z1 and you’ll be looking at around £16-17,000 for a good one with the knowledge that prices are only going to rise. 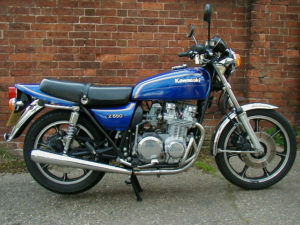 As a mid 20 year old, my demands were more modest and I settled on a 1980 Suzuki GS550ET in red which lasted me for 14 years and some 50,000 miles of happy biking. 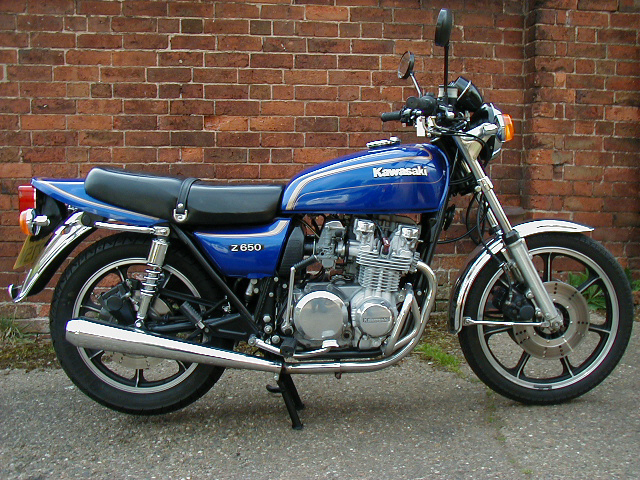 This mid range model was my bike of choice simply because I couldn’t get my hands on my preferred choice the Kawasaki Z650C preferably in metallic blue. 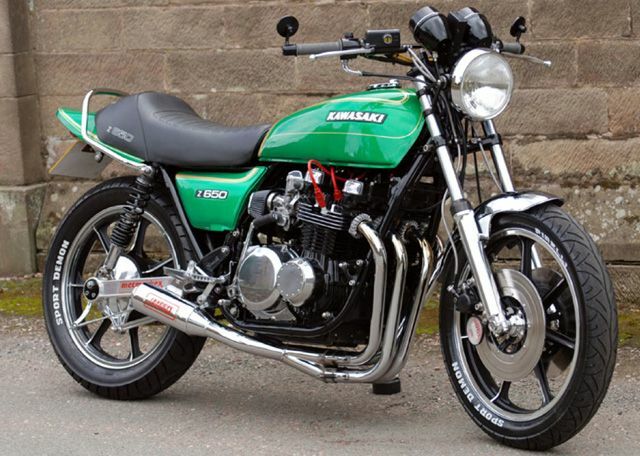 The market for Z650’s now is hot with models from 1979 onwards in good condition anything from £3000 up to around £6000 for a mint example, if you can find one. Back in the day everyone wanted to put the loudest exhaust possible on these things, with the popular ones being Yoshimura, Motad, or Harris four-into-one pipes, just in the same way that Akroprovic has cornered the market these days as the bespoke ‘must have’ addition. The funny thing is that, with UJMs, stock is the way to go now and getting a regular set of exhaust pipes from the original manufacturer has become an arm and a leg if and when you can find a set. In a world full of full fairings and no chrome, the idea of a bike with a 2/4 seat and K&N air filters and loads to polish just rings a bell with me. I know in the fullness of time you forget that you used to have to strip the brakes every six months and change the terrible seals but times have moved on and hopefully modern seals last longer. When you look at the examples shown above, you can’t help but appreciate the effort involved by the owner to get it to this level of finish. 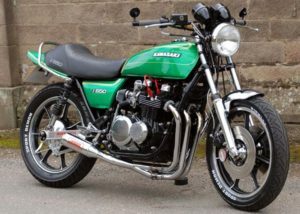 Kawasaki themselves recognised the level of appreciation in these models by people of a certain age by imitating them with the 550, 750 and 900 Zephyrs that used newer technologies on the same type of styling. Even the colours that the manufacturers used were so much more appealing than the current pastel choices you have today. Who doesn’t recognise the classic Candy Apple Red metallic colour that was a trademark Kawasaki shade. And then, if you sneak a look at the ones shown here, that dodgy looking arm thing by the side badge is what was known as a kick start, which was always a fail safe when the new fangled electric starter button let you down. In performance terms these mid range beasts all ran out of puff around 120 mph but you needed to be a man to get there as you had no fairing protection in those days and anything above roughly 90mph and you needed arms of an Ox to hold on tight. In the year 2017 I’m sure you wouldn’t want to go anywhere as fast as that on your summer days out, but the endearing charm of a UJM still draws you in, in times when it seems rare to treat yourself to something off your bucket list. The demand for UJM’s has become so large that specialist dealers now scour warm dry countries like the States for examples that they can drag back to Europe for a reasonable price in the knowledge that there is a tidy profit to be had from a good example. So without boring you the reader for any longer, my question at the very start of the article remains the same. Is it an age thing? Have those of us who now are mid fifties and grey started to wax lyrically about old tack or are these things genuinely better bikes with more soul than the current crop of offerings? Only you the reader know the definitive answer, but if you ask me, in challenging times when credit crunch UK has rendered us all nailed to the perch and in need of something to get us away from Brexit boredom, perhaps a throw back to the glory days would be a nice step and an indulgence that might just be worth Justifying.